Always the right move. RETAIL AVAILABILITIES FLORIDA Flamingo Market Place | Pembroke Pines Bravo, 21st Century Oncology , Social Security 4641 SF 2nd Generation Restaurant FMS Corners | Pembroke Pines Subway, Asian Buffet, Animal Hospital Hollywood Palms | Hollywood Publix, Walgreens, Dollar General, Memorial Healthcare System 1340 SF – 1600 SF Point Plaza | Temple Terrace Winn Dixie, Family Dollar, Rent King 3000 SF Shoppes at Margate | Margate Dollar Tree, Advance America, Carnival Supermarket 1500 SF – 7500 SF+ Shoppes at Pembroke | Pembroke Pines Michaels, Weight Watchers, Allstate 1300 SF; 2240 SF NEW YORK Adams Commerce Plaza | Hauppauge Dunkin' Donuts, The Grill Room, Blimpie 1150 SF Baldwin Square | Baldwin Best Buy, Applebee's, CVS 1675 SF – 3350 SF Bay Shore Commons | Bay Shore Stop & Shop, Retro Fitness, Chase Bank Bethpage Plaza | Bethpage DMV, ProHealth Assoc., Dunkin' Donuts, Wells Fargo HM 6670 SF – 8022 SF Divisible Bi-County Commons | East Farmingdale Giunta's Meat Farms, Retro Fitness, BFCU Bohemia Commons | Bohemia Giunta's Meat Farms, AutoZone, CVS, Pets Warehouse 1040 SF Burnside Avenue | Bronx Jimmy Jazz, Wing Stop, Spring Mobile Cherry Valley Plaza | West Hempstead Pet Supplies Plus, Payless Shoes, GameStop, Euro Wax Center 15,000 SF Divisible + 50 Car Garage Huntington Crossroads | Huntington Station H&R Block, Domino's Pizza, Pollo Compare 3300 SF Second Floor Huntington Shoppes | Huntington Station AutoZone, Carvel, Pharmacy Kenmore Plaza | Sea ford Gino's Pizzeria, Liquor, Antiques Lake Shore Plaza | Lake Ronkonkoma ShopRite (Coming Soon), Chase Bank, Pet Supplies Plus, Wells Fargo 1124 SF – 2298 SF; 5000 SF Out Parcel Divisible Main Street Promenade | Nyack Anchor/Redevelopment Subway, H&R Block 10,380 SF + 2nd Generation Restaurant Spring Valley Marketplace | Spring Valley Michaels, Bed Bath & Beyond, Christmas Tree Shops 1714 SF – 7000 SF; 36,000 SF Divisble The Shoppes at Market Street | Nanuet Pinot's Palette, BounceU, Jenny Craig, Quest 2600 SF; 4628 SF Waverly Plaza | Holtsville Allstate, Dunkin' Donuts, Tanning, Deli, Pizza 900 SF NYC | Various opportunities in all boroughs NEW JERSEY Aviation Plaza | Linden Target, Home Depot, ShopRite, AMC Theatres 2200 SF Edison Plaza | Edison ShopRite, Capital One Bank, Moster Mini Golf 2100 SF; 3000 SF Endcap Divisible Princeton Meadows | Plainsboro Asian Food Market, Subway Royal Plaza | East Windsor City Streets Café, Citi Financial, Allstate 1000 SF – 2850 SF Can Combine + 2nd Generation Restaurant For over 80 years, retailers looking to land in the right space have chosen to lease from Milbrook Properties time and time again. Maybe that's because every property we add to our east coast portfolio is always the right move. 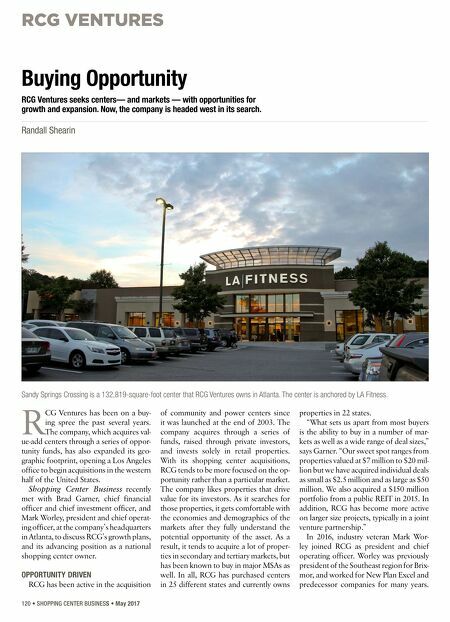 Contact us today for our acquisition criteria and exciting leasing opportunities. 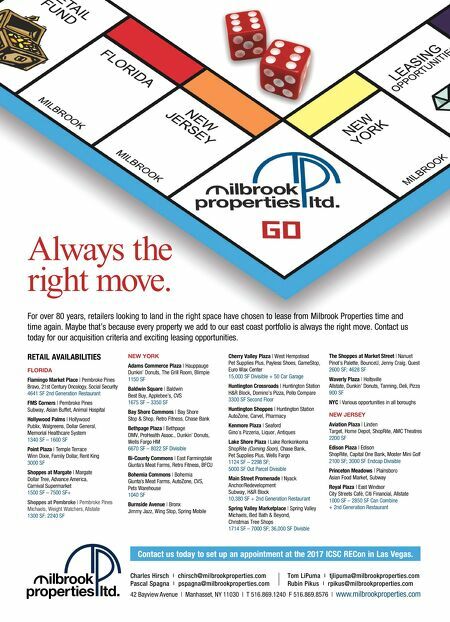 Charles Hirsch | chirsch@milbrookproperties.com Tom LiPuma | tjlipuma@milbrookproperties.com Pascal Spagna | pspagna@milbrookproperties.com Rubin Pikus | rpikus@milbrookproperties.com 42 Bayview Avenue | Manhasset, NY 11030 | T 516.869.1240 F 516.869.8576 | www.milbrookproperties.com Contact us today to set up an appointment at the 2017 ICSC RECon in Las Vegas.